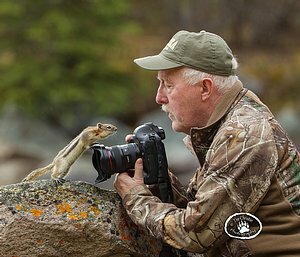 Tim is an active member of the Outdoor Writers Association of America (OWAA), the Professional Outdoor Media Association (POMA), and the North American Nature Photographers Association (NANPA). His images have received critical acclaim by all three groups. OWAA has honored Christie's work with first place awards in various contests in each of the last 10 years. Four times, including 2017, his images have received the OWAA Presidents' Choice Award for the top photograph in all contests that year. In 2011, 2015, 2016 POMA awarded Christie the Pinnacle Award for the top photo entered in their annual professional awards competition. Two of Tim's images in 2011 and another in 2012 were selected for inclusion in the prestigious NANPA Showcase competition. In 2015 Christie was awarded OWAA's Excellence in Craft Award, which recongnizes his lifetime of achievement in both photography and writing. The award began in 1971 and such noteables as Leonard Lee Rue, Erwin Bauer, Bill McRae, John Madson, Norm Strung, Gene Hill and Chris Madson have recieved this award. Upon receiving the award, Christie said, "To have my name mentioned in the same context as those heros in communicating the outdoor experience, well, it is incredibly humbling." In addition to being a full-time freelance photographer, Christie is an accomplished writer with publication credits in numerous magazines. In September 2012 OWAA awarded Christie two top tier awards in their annual magazine writing contests. In 2011 his article entitled, “A Long Shot” published in Colorado Outdoors received the OWAA President's Choice Award for the top magazine article of those winning awards that year. POMA also recognized Christie with first honorable mention in the 2011 Pinnacle Awards for magazine writing for his article, “Memories in Blue Steel” published by Wyoming Wildlife. In 2012 Christie recieved a POMA Outstanding Achievement Award for this article, "Hunting for Memories" published in Wyoming Wildlife. In 2017 Christie received the POMA Pinnacle Award for his article, "Hunting Partners" in Colorado Outdoors magazine.